Not so much a 'then and now' today, but more a 'before and after'. 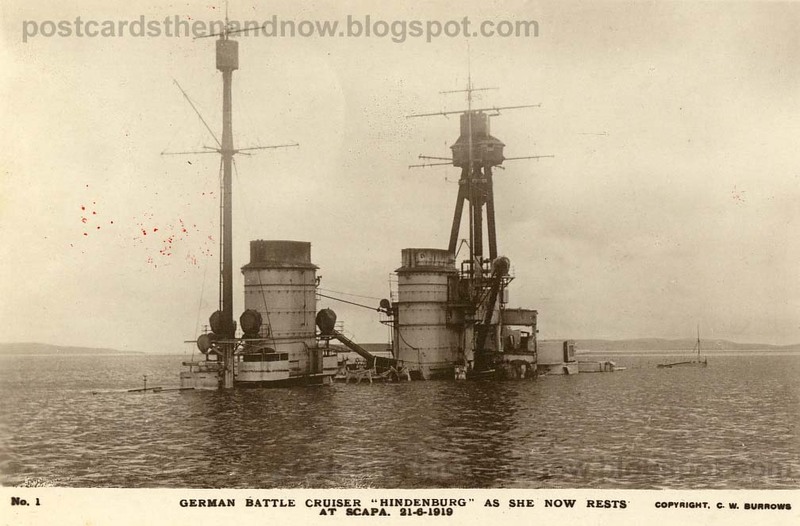 These old postcards show the battlecruiser SMS Hindenburg before and after her scuttling in 1919. 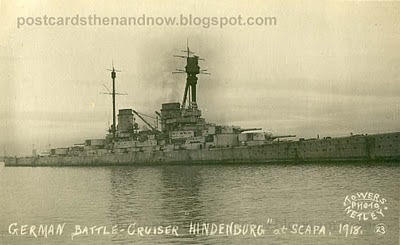 I don't have the space here to describe the events of the scuttling of the German High Seas Fleet at Scapa Flow, but the wikipedia entry is a good place to start and has some good links at the end of the article. The first postcard shows the ship in 1918. 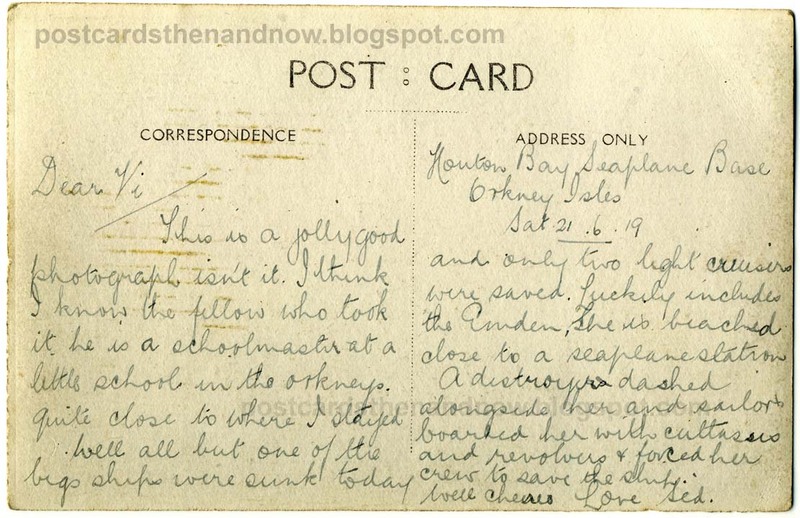 The message on the back of the card is remarkable - posted (probably in a letter) from Houton Bay Seaplane Base on the Orkney Isles, Saturday 21st June 1919 - "Dear Vi, this is a jolly photograph isn't it. I think I know the fellow that took it he is a schoolmaster at a little school in the Orkneys, quite close to where I stayed. Well all but one of the big ships were sunk today and only two light cruisers were saved. Luckily includes the Emden, she is beached close to a seaplane station. A destroyer dashed alongside her and sailors boarded her with cutlasses and revolvers & forced her crew to save the ship. Well cheers, Ted". 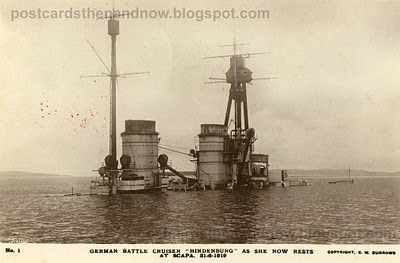 The second postcard shows what the Hindenburg looked like after the scuttling. The wreck was eventually raised and scrapped in 1930. The Street View image below doesn't show any view of the wrecks, but it does show how beautiful Scapa Flow is today. As usual, click on the pictures to enlarge. This is my entry for today's Sepia Saturday blog. There's quite a story behind the scuttling of the German Fleet and well worth reading about. Two good postcards. What an interesting post! I enjoyed it very much. Your story and Bob's comment have made me curious. I'm off to read more. That is a beautiful landscape at Scapa Flow. I enlarged the first postcard and I'm really amazed at how BIG the ship is. You've piqued my curiosity. I'm going to follow your links and read up on the scuttling, a subject with which I'm totally unfamiliar. Thanks for the interesting post! wow great postcards, and the note on it is just wonderful...funny how he used the word jolly and was kind of mocking with the sinking that quickly followed....I so enjoy reading the backs of postcards in shops....they wrote such interesting stuff as normally! Thanks! That's an interesting pair of postcards, and I enjoyed reading the Wikipedia article. What a waste to scuttle all those ships. Love the "Well cheers Ted" at the end. All the drama of the boarding and then "Well cheers Ted." Quite interesting and amusing. The beauty of this technique you use of comparing old postcards view to modern perspectives is its ability to take ever-changing history and fix it around never-changing locations. 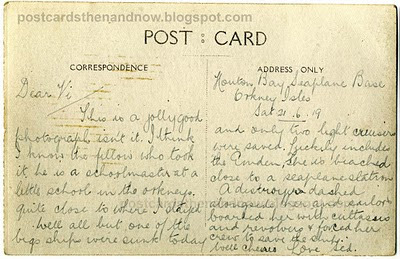 Today such a note like on this card might be an email or a twitter and deleted in an instance. History comes alive when photos have this extra value. And what about photographers trying to pose a battleship? Standing in a rowboat trying to keep the camera steady? The ship is so BIG! Amazing. (Can you tell I don't get to the ocean much?) This was an interesting post. I'll have to read more about it. Scapa Flow looks beautiful! Thanks for sharing a place I probably would have never known.